Algerian (or square) eyelets can be used to fill a blank space where you didn’t cut the threads away. It’s a great way to add detail between the edging and the Klosters, or to cover the leftover threads where you aren’t able to cut. In the picture, you can see the eyelets around the edge. I think of these as filling stitches because they take up otherwise boring space. 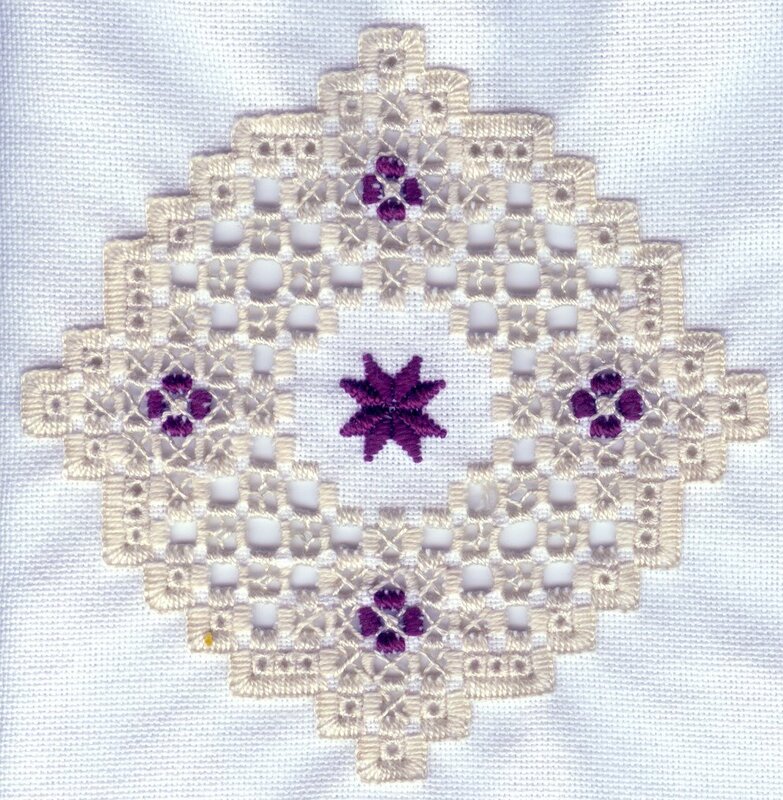 There are other eyelet stitches, which I think of as decorative stitches, which I’ll cover another time. To make an Algerian eyelet, you work in a square of 4 fabric threads by 4 fabric threads. Secure your thread behind a Kloster, then bring your needle up in the center of your square. Go down in a corner hole, and pull taut. Come back up in the center, and go down in the hole next to your first stitch. Pull taut. You want the hole of the eyelet to open up, like a shoe-lace hole. As you continue around the square, keep the tension even, and a nice little circle hole should open in the center of your square.